This is a Chrome extension I worked on with a developer, Dean Sofer. Find My Bookmarks is a Chrome Extension that locates all your bookmarks for the current domain. 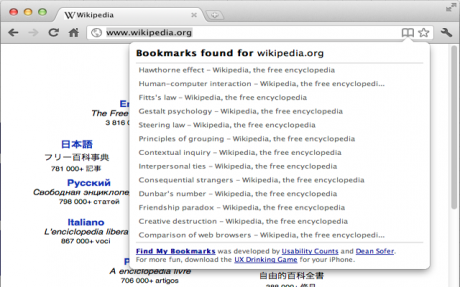 If bookmarks are found, the icon appears and you can just click on it to get a list. It’s super-beta, but try it out and give feedback on what you think it should be.